Evolution of river channel pose safety risks for embankments, navigation, and ports. Highly utilized in navigation and having abundant embankments, the segment of the YR from Datong to Xuliujing is greatly affected by human activities. A recent study reports the influence of human activities on river channel evolution in the Datong to Xuliujing reach of the YR (Fig. 1). Previous scholars have performed a series of studies using field surveying, GIS technology, and historical data. Chen et al. (1959) summarized the development model of the YR estuary using shallow and deep borings and historical data. Qu (2014) analyzed the channel change from Datong to Jiangyin reach using GIS technology, he reported that although the sediment supply from upstream decreased, sediments amounts to 4.78 hundred million cubic meter deposition in the reach from Datong to Jiangyin between 2003 and 2008. Many scholars, using side scan sonar and sub-bottom profiler methods, have studied the development mechanism of the dunes. They thought that between Anqing and Jiangyin reach, characterized by anabranching channels, small-scale bedforms superimposed on large dunes occur widely due to intensive riverbed sediment transport from frequent diverging/converging flow. Some studies have taken a typical reach of the river as an example and studied the relationships between water and sediment discharges and channel changes. These studies have greatly increased our understanding of the evolution of the subaqueous topography. 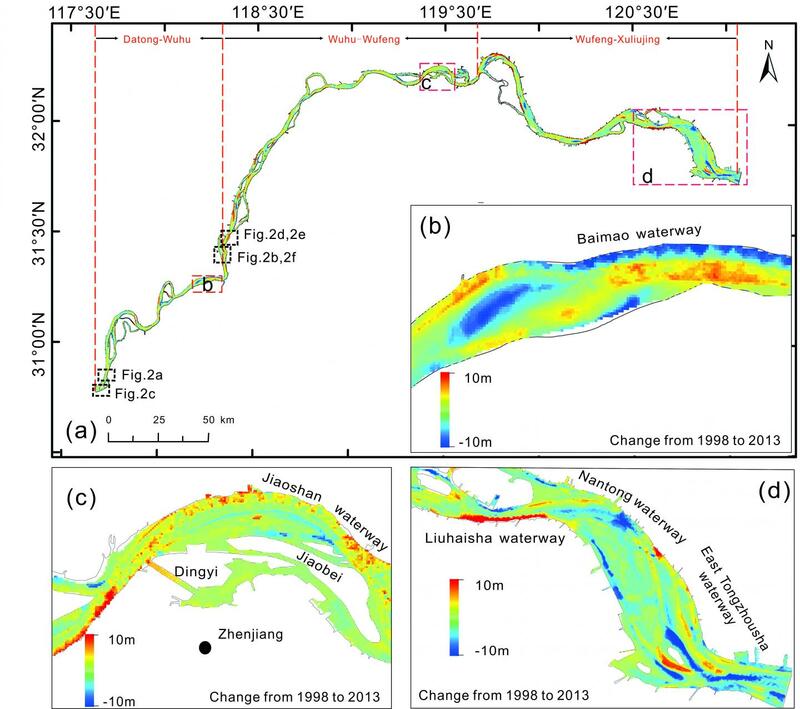 This study conducted measurements of subaqueous topography between Datong and Xuliujing in the Yangtze River using a SeaBat 7125 multi-beam echo sounder, and the channel change from 1998 to 2013 was calculated using historical bathymetry data. The overall pattern of changes through the studied stretch of the river was erosion-deposition-erosion. Erosion with a volume 4.7 hundred million cubic meter occurred between the Datong and Xuliujing reach. Dunes are the most common microtopographic feature, accounting for 64.3% of the Datong to Xuliujing reach, followed by erosional topography and flat river topography, accounting for 27.6% and 6.6%, respectively (Figs. 1, 2). We concluded that the overall trend of erosion occurred in the study area mainly due to the decreased sediment discharge following the closure of the Three Gorges Dam. However, other human activities were also impact factors of topographic change. Use of embankments and channel management reduced channel width, restricted river meandering, and exacerbated the erosion phenomenon. Human activities have a direct impact on the development of the micro-topography. This research was funded by the Natural Science Foundation of China (Grant N0. 41476075); Foundation of Geological Survey of China (Grant No. DD20160246).